We have created a new product for a company-developer and manufacturer of glucometers, a mobile gauge of glucose concentration in the blood that works paired with mobile phones under iOS or Android control. 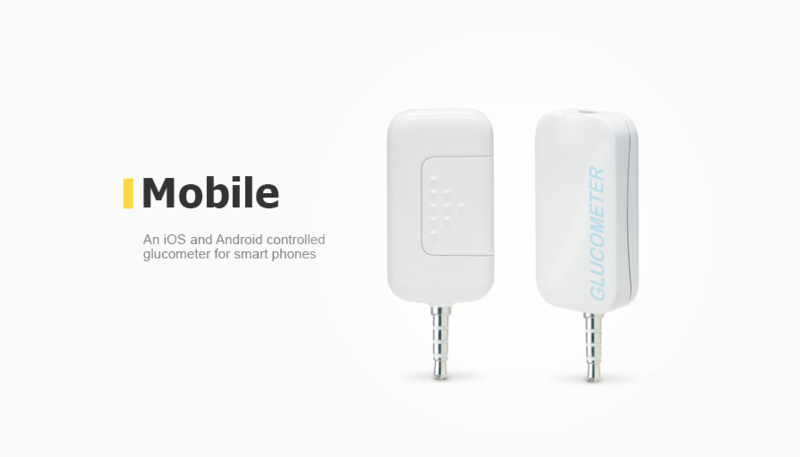 The glucometer is connected with a smart phone via a standard audio input and the results of measurements are displayed on the screen of a mobile application. 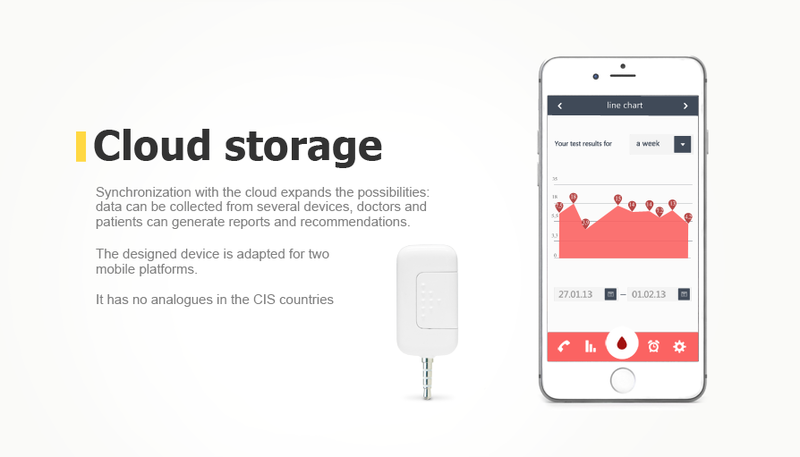 Synchronization with the cloud expands the possibilities of the device: data can be collected from several devices, doctors and patients can generate reports, including recommendations on nutrition and medical treatment. The designed device has no analogues in the CIS countries, and stands out in the global market: it is adapted for two mobile platforms, while other known solutions work only with the Apple products. It is a developer and manufacturer of express glucose concentration meters in the blood. To develop a portable device, a glucose concentration meter in the blood, in the form of an attaching gadget for iOS and Android based smartphones. The device is connected via the audio jack, and thus the data can be transferred to the smartphone. Firmware development for the microcontroller which operates as a part of the device. Software development for iOS and Android based smartphones. The results of measurements are transferred to the application, where they are processed and systematized, after that they are sent to a profiled medical center for a remote patient supervision by patient’s doctor. The base hardware platform of the device is a Texas Instruments MSP430G2553IRHB32R microcontroller (MSP430G2 family), it operates at the frequency up to 16 MHZ and allows to implement all necessary functions with the minimum amount of external microchips. The microcontroller has 512 bytes of RAM and 16 kb of flash memory which is enough to perform the task of communication with the smartphone and reading the code from the code strip. To conduct measurements, there is a UIC1101 microchip designed by the customer. In order to connect test strips, a lamellar connector (designed by the customer) located directly on the PCB is used. 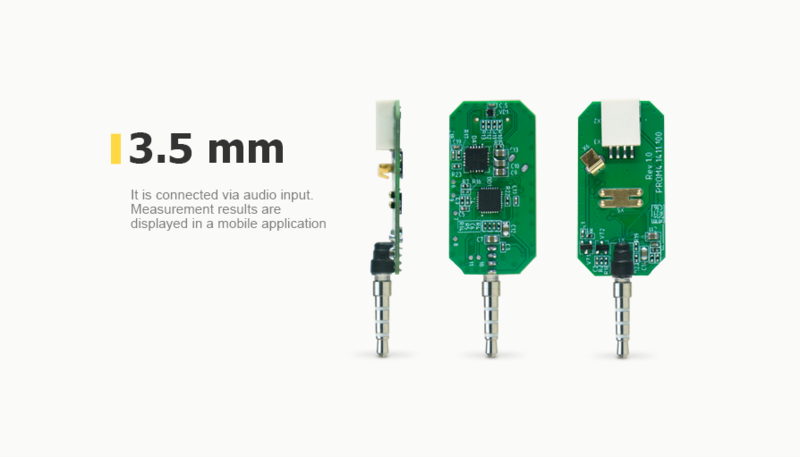 Connection with a smartphone is carried out via a 3.5 mm/4 output standard audio jack. The power supply of the device is implemented by standard CR2032 type batteries. Figure 1. A block diagram of the device. A GPIO interface was implemented for communication between the specialized microchip and the UIC1101 microcontroller. The interface includes two functions: writing a byte to the specified address and reading a byte at the specified address. The data exchange between the microcontroller and the smartphone is implemented via FM1 encoder and decoder. The software interface includes the functions of bytes reception and transfer. To debug software code, a debugging information withdrawal to the UART is implemented. Microcontroller power management is implemented by two modes: Active and Idle. Switching to Idle mode occurs after completing the last transaction (data transfer to a UIC1101 or to a smartphone). The horizontal layout which was optimal for the customer could not solve the problem with a variable arrangement of audio jacks on smartphones and the size ratio of other similar devices. The Promwad engineers were able to implement all necessary functionality inside the enclosure of the small form-factor. In particular, the device is equipped with a 3.5mm audio plug to connect to a smartphone and a connector for test strips. a screw cap with a coin slot for the battery compartment. In the process of application development, one of the main challenges was to implement interaction between the mobile software and the glucometer. That task was solved by analyzing and decoding audio signals allowing various peculiarities of this kind of data exchange implementation in devices with different platforms (iOS and Android) as well as depending on manufacturers and software version. A convenient informative user interface was designed to work with measurements and test results. The interface guides a user step by step through test stages accompanied by text comments and graphics support. We continue working on the part of the application which will later become a diabetic patient’s "diary". The application will become a patient’s self-testing tool which is going to support three directions of diabetes therapy: medication, diet control and physical activity. At the present time, there are not any devices similar to this mobile glucose meter and the application on the Russian-speaking market and in the CIS countries. However, similar devices exist in Europe, America, and Asia. At the same time, such devices are designed for users of Apple smartphones, and they are not intended for a wide audience who use smartphones running on OS Android.